We’re all thrilled by the sheer variety of fish cleaning table tops available out there in the world. But the truth is that whether you want one that can be mounted on your dock or one with an overhang, only the best table will meet or even exceed your expectations. 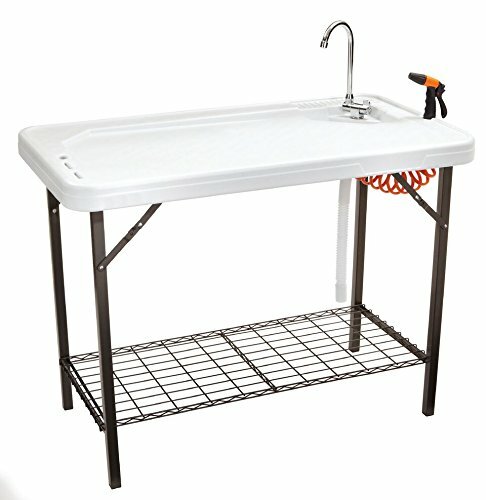 In particular, a fish cleaning table with sink would always be an awesome bonus. But to find one that fits the bill, you need to dig deeper, beyond what the latest reviews may talk about. That’s precisely why we compiled this write-up. With questions abound as to the right way to decide which cleaning station to settle for, we zeroed-in on a few quick pointers. As it turns out, very few cleaning tables actually meet these set of requirements. And that’s why we chose to prepare the following write-up to answer some of the questions you might be having in mind. How to Make You’re Own Fish Cleaning Table! Our goal is to make sure that you have a perfect place to fillet your day’s catch from. So, if you have a few seconds to spare, the table below contains outdoor fish cleaning tables for easy decision-making. Tricam-Outdoor Cleaning table stands tall among the best tables in the market. The table is also quite affordable and comes with a one-year guarantee. 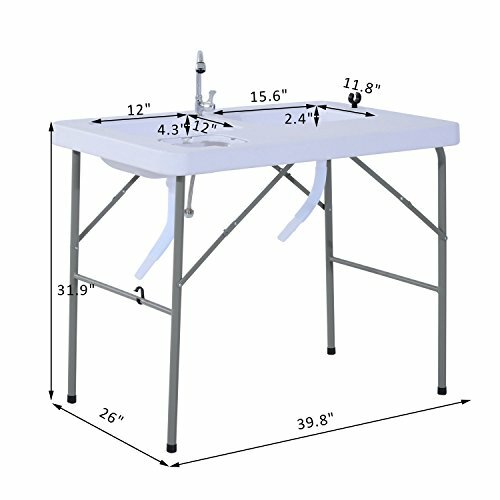 It’s a remarkable outdoor cleaning table for fish and game and that’s because it is built from high-grade and durable materials. The Tricam is 37-inches high and measures 44-inches long by 23.5-inches wide. What’s more? It weighs 27 pounds and has a maximum load capacity of 150 pounds. 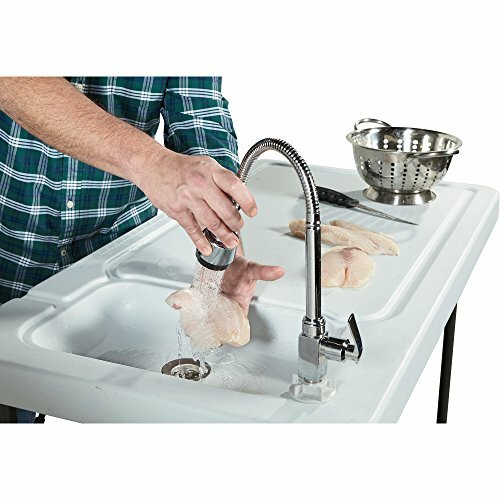 For added convenience, this cute table has a quick-connect and disconnect stainless steel faucet. In addition, it is easy to connect the faucet to a garden hose. The tapered channel improves the table’s water drainage potential. And to crown it all up, the Tricam comes with a drain hose and built-in ruler that you can use to make some precise cuts. Clean your catches conveniently without hassles using Coldcreek Outfitters Table. It is a perfect table for all your outdoor activities including camping, picnics, and backpacking among others. The table is designed with two sinks giving you plenty of space for your cleaning activities. What’s more, you can cover the two sinks with two inserts which are provided and convert the table into a flat surface for serving, eating, chopping or workspace. The table is constructed from polyethylene for durability. Polyethylene is also light to ease transporting it. One sink is 2.5-Inch deep while the other is 4.5-Inch. Both sinks come with a removable drain plug. The table is quite easy to set up. It is also easy to dismantle after use. The top folds easily for ease of storage and transport. The height of the table is 33”, which is a standard height, not too tall or too short to suit most users comfortably. The table has a built-in refuse opening to hold a small garbage bag for easy cleaning after use. Also read: The Best Boat Shoes for Men and Women Reviewed – Latest Guide & 10 Best Kayak Seats Reviewed: Are These The Best For The Money? 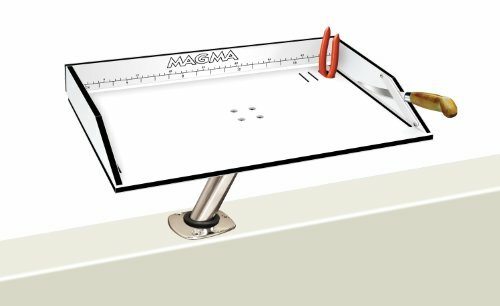 Magma table is specifically designed to be installed in a boat which has limited space, making it a perfect choice for anglers who want convenience. The work surface can be used conveniently for cleaning, cutting and slicing. The table is quite convenient because it is not a permanent fixture like other boat tables, where the table stands are installed permanently. The table is constructed from UV stabilized high-density polyethylene. The table has a ruler engraved on it. In addition, it has a slotted back and grooved sides for overboard drainage. The table is quite easy to set up. Simply slide the table’s Levelock rod holder mount into a rod holder, and you are good to go. Also dismantling the table is quick and easy. It involves removing its rod holder mount from the rod holder. There are two models available, one is 20 inches, and the other is 31 inches. It is quite easy to set up, the purchase includes a Levelock rod holder mount. SEEK Deluxe table packs unique features to hasten your outdoor fish and game cleaning exercises. The table comes with an extendable sprayer head for more convenient cleaning. It also features a quick-connect faucet. The table is quite easy to connect to a garden hose to help in cleaning conveniently. Besides, the table has raised edges and a sloped surface which maintains the working area dry, as water easily flows to the sink area. In addition, it has a wire-mesh shelf below the table which can be used as a tool shelf. Another remarkable feature of this table is its foldable legs which makes the table convenient to carry and store. The table is not flat but has a sloped work surface, which limits the table to cleaning only. It can’t serve well as a serving table. Kotula’s Deluxe table removes hassles out of fish cleaning. The table can also be used for backyard parties and other outdoor functions. The table is quite portable and an easy to set up unit. The table boasts locking legs which when folded makes it easy to store the table when not in use or to transport it easily. The unit has a sprayer faucet that is flexible and also easy to install. The faucet easily connects to any standard garden hose for your convenience of cleaning. The package includes a fish cleaning kit of a fillet knife, odor removing bar, cutting board, trash bag holder, wire shelf and two bowls. Even though the table is more expensive than other brands in the market, the kit makes it a good bang for the buck. 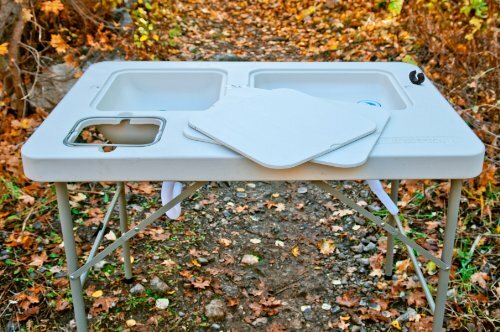 Kotula’s Camp Fish cleaning table makes the task of cleaning fish easy. The table can also be used for backyard parties and other outdoor activities. The faucet is stainless steel and hooks to a standard garden hose to provide fresh cleaning water. Also, the table is fitted with a sink which has a long and flexible drain hose connected to it. The drain hose empties to a bucket or floor for the convenience of disposing of dirty water. The table has locking legs for easy folding, making storage and transportation easy. 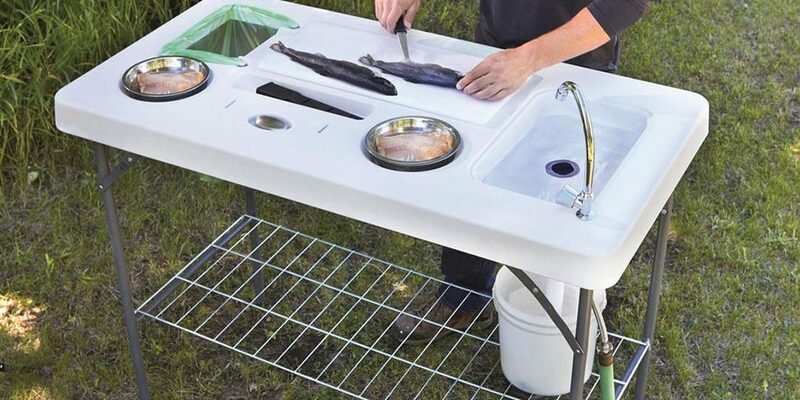 Outsunny Portable table will take your fish cleaning tasks to the next level. It can also be used for other outdoor activities like a BBQ table or used for backyard parties. The table has a steel frame. It has a working surface that is ruggedly built using durable HDPE. The table has a maximum weight capacity of 132lbs. The table is equipped with two sinks for your convenience. It also has a faucet that can be connected to a hose for fresh water. In addition, it has a built-in ruler and a garbage bag holder. Should The Table Be Portable or Permanent? Permanent tables are loved by many because they tend to be stable and sturdy. However, portable ones seem to have an upper-hand when flexibility and versatility are of importance. In order to determine which table is ideal for you, it’s important to understand your style of preparing fish. Do you like preparing fish from the same place? Then a permanent table would suffice. Do you prefer to take your table with you to different places? Then a portable table would be the best fit for you. But either way, you want to end up with a table that’s long-lasting, well-built, and generally strong. What About a Dockside Model? Once again, we’d like to emphasize that your fishing style should, ultimately determine the kind of table you settle for. But as far as dockside tables are concerned, we’d recommend taking a few more factors into consideration. In particular, you want to make sure that the table is made of high-quality metallic materials. We particularly prefer aluminum and stainless steel. Fishing in saltwater? We’d specifically vouch for aluminum as it offers the best value when exposed to salt air and sea water. Curved fish cleaning tables are recommended for dockside filleting. They are particularly designed this way so they can easily move over the water. And that, ultimately, makes some space for the drainage in addition to conserving space. Talking about space, please note that you can always add accessories to help you do that. For instance, you can consider getting a table with drawers and cup holders. We have talked extensively about the design and stability of the table. However, there’s one crucial thing that we haven’t talked about – the table top. As you know, this is where all the action happens. And so you want to make sure that the table top you settle for is easy-to-clean, weather-resistant and non-porous. A good table top is one that’s made from FDA-approved polyethylene. Such a material is easy to clean and also generally safe for food service. Most importantly, the material doesn’t degrade as it comes in contact with your food. Another thing you need to consider is that the table top should be corrosion-resistant. This is the surest way to make sure that your food is never contaminated. Our favorite among the seven is the Coldcreek Outfitters Table Outdoor Table. That’s because it’s pretty stable and functional. It has a sink and is also made from high-density, FDA-approved polyethylene. Its ergonomic design also adds onto the reasons why we particularly settled for it. 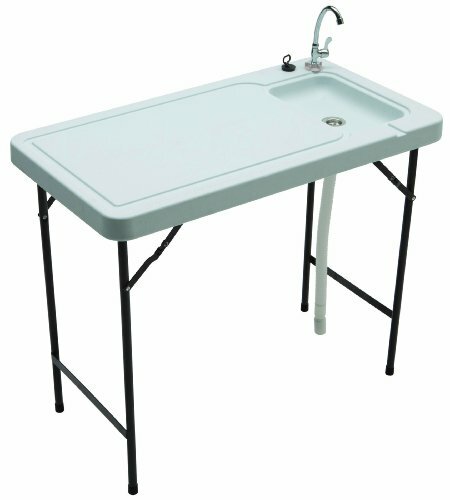 There are three things that matter when it comes to choosing a fish cleaning table. These are stability, functionality, and safety. So, before you settle on any table top, make sure that (at the very least) it ticks those three boxes.